JACKSONVILLE, Fla., Oct. 31, 2017 /PRNewswire-HISPANIC PR WIRE/ — When natural disasters knock out critical power supplies, customers around the world count on APR Energy to deliver large-scale power fast. 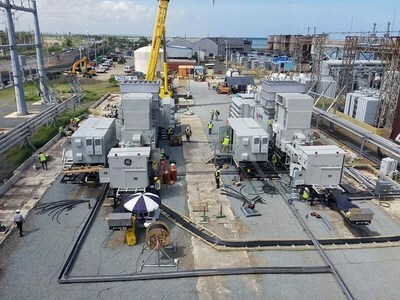 The latest is hurricane-ravaged Puerto Rico, where APR Energy has commissioned two mobile gas turbines and connected them to the local power grid just 15 days after its equipment arrived on site. The fast-track solution features two new GE TM2500 Gen 8 mobile gas turbines, which will help to restore power in the San Juan area and stabilize the power grid, reducing the risk of outages. On October 13 – the day after the contract was signed with U.S. Army Corps of Engineers contractor Weston Solutions – APR Energy’s turbines arrived at the port of San Juan. The following day, they were transported to the Palo Seco power plant for installation. “APR Energy is committed to helping Puerto Rico for as long as necessary, and we stand ready to provide additional generating capacity and grid stability support as requested,” Campion said. The Puerto Rico project uses the newest generation of GE’s turbine technology found in jet aircraft engines. The fuel-flexible turbines offer a higher power density and lower emissions than competing solutions using diesel reciprocating engines, as well as the ability to switch from diesel to natural gas if necessary. As the world’s leading provider of mobile turbine power, APR Energy has used the technology to generate electricity on other Caribbean islands including Martinique and St. Thomas in the U.S. Virgin Islands. On St. Thomas, where the company has operated since 2012, its highly reliable TM2500 turbines continued to provide electricity to island residents while much of the power generation in other parts of the Caribbean was knocked out following Hurricane Irma in early September and Maria two weeks later. More than 200 mobile and trailer-mounted TM2500s have been deployed globally and in some of the most extreme conditions on Earth, including the deserts of Africa and remote communities in Asia. Based on GE’s proven LM2500 product family with over 90 million operational hours of experience, the TM2500 can be transported via land, sea or air and can be commissioned in days. It can ramp up to full power within minutes to support grid security during periods of high demand, and the latest TM2500 unit can generate more than 35MW of power using gas and/or distillate liquid fuels for greater flexibility. APR Energy is the world’s leading provider of fast-track mobile turbine power, and has installed over 4,200MW of power capacity across more than 30 countries. Our fast, flexible and full-service solutions provide customers with rapid access to reliable electricity when and where they need it, for as long as they need it. Combining state-of-the-art, fuel-efficient technology with industry-leading expertise, our scalable turnkey plants help run cities, countries and industries around the world, in both developed and developing markets. For more information, visit the Company’s website at www.aprenergy.com.